If you're sick of paying more and more to acquire new patients. If you're spending a small fortune on advertising in print or digital channels like Google Adwords or Social Media, then this book is for you. In this easy to follow 28 page guide, I show you exactly what your desired customers now respond to when making decisions, how to win their trust, and how to generate within them, a burning desire to become your next client. I also reveal how to build out your own online lead generation machine that runs on autopilot, while you do what you do best and take care of your patients. Medical professionals running a practice have already noticed it's getting harder and harder to find the quality patients they need to survive, thrive and turn a profit. In just the last 5 years a revolution has occurred and the power has shifted into the hands of your potential customers. In this book I reveal exactly why you need to adjust your marketing strategy and how you can evolve the way you market and sell your services. There are already a small number of practices just like yours, reaping massive rewards by getting smarter about how they market themselves. It's up to you to decide if you're going to be one of them or if you're going to keep paying too much to acquire new customers. 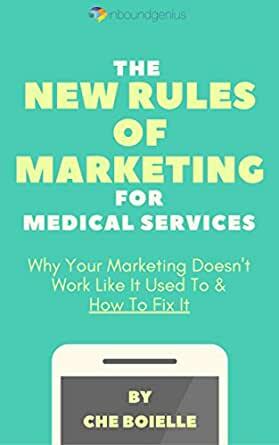 After reading this book, dozens of Cosmetic Surgeons, ENT specialists, Weight loss surgeons and other medical professionals, have already cancelled their expensive glossy magazine ads, stopped running discount offers on Facebook and begun taking up the challenge of producing high-value content. It's content that now attracts patients to the leaders in any field and I'm going to show you how to use it to take care of your lead generation needs. The doctors who have lines out their door and the doctors in high demand are the ones who are actively helping prospects with relevant content. Are you ready to reimagine your marketing and stop throwing money away on campaigns that don't work? Great, I'll see you inside.